AT A UK-Bangladesh conference in London, Bangladesh launched its Climate Change Strategy and Action Plan in September. The uk agreed to provide 75 million (us $ 130 million) in grants over the next five years to enable Bangladesh overcome the losses caused by natural calamities like floods and cyclones. The strategy prioritizes adaptation and reduction of disaster risks, also addresses low carbon development, mitigation, technology transfer, and the provision of adequate finance. The 2009-2018 plan aims to build the capacity and resilience of the country to meet the challenge of climate change. The Ministry of Environment and Forests is currently working out the cost of implementing it. The government devised the plan in consultation with non-profits, research groups and the private sector. It draws from the 2005 National Programme of Action. 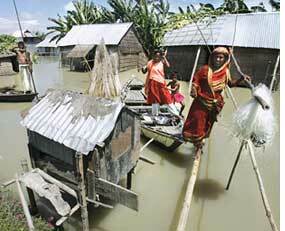 Climate change would severely challenge economic growth needed to reduce poverty in Bangladesh. Predictions show the country will face increasingly frequent and severe floods, tropical cyclones, storm surges, and drought. In the worst case scenario, sea level rise could result in the displacement of millions of people--environmental refugees--from coastal regions, unless existing coastal polders are strengthened and new ones built. Over the last three decades, Bangladesh has invested over $10 billion to reduce vulnerability to natural disasters, on things like embankments and cyclone shelters. It has also developed a comprehensive system of disaster preparedness and mitigation. Most of Bangladesh lies in the delta of three of the world's largest rivers: the Brahmaputra, the Ganga and the Meghna. The topography of the country is mostly low and flat; two-thirds is less than five metres above sea level and susceptible to floods, if not from rivers and rains, then from tidal waters in the low-lying coastal areas. A severe tropical cyclone hits Bangladesh once every 3 years on average, with winds of over 150 kmph and storm surges up to seven metres high. Drought devastates crops seasonally, especially in the northwest, which gets low rainfall. Unemployment leading to seasonal hunger is common here. Reports of the Intergovernmental Panel on Climate Change predict increasing intensity of monsoon rains, which along with the melting of Himalayan glaciers could exacerbate floods. The panel also forecasts sea level rises between 0.18 and 0.79 metres, which could increase flooding and saline intrusion into aquifers and rivers. Supporting communities and people in rural areas to strengthen their resilience and adapt to climate change will remain a high priority in coming decades. However, with increasing urbanisation and economic growth, the type of risks Bangladesh faces will change. The direct annual cost to the national economy of natural disasters over the last 10 years (damage and lost production) is estimated to be between 0.5 per cent and 1 per cent of gdp. Over the last 10-15 years, the fatalities from natural disasters has declined, as the country's ability to manage risks, especially floods and cyclones, has improved and community-based systems have been put in place.